July 2012 – Andrew James Taggart, Practical Philosopher, Ph.D.
For the foreseeable future, the focus of my philosophical practice and my work with organizations will be on the art of inquiry. One aim of the art of inquiry is to lead the inquirer into a state of mental confusion (aporia) or bewilderment. The bewilderment implies that the inquirer can no longer say for sure what is true, right, useful, or necessary to do. The pain is the pain of not-knowing. This is how we do things, have done things here. We have adopted this set of procedures, subscribe to this approach, apply this method, follow this script. There is no question but that we ‘must’, ‘have to,’ ‘need to’ follow through with this. Questions tend to be ‘technical’ in genre: how to do something or other, how to bring about a particular effect, what steps are to be taken if the desired outcome is to be reached. A good inquiry may call into question any or all of the following: whether this is the right or best way of doing things; whether there are irresolvable problems built into the very structure of the organizations, problems that will compel the organization to collapse in time; whether the highest aim is actually worth aiming at; whether this theory or approach is open to devastating anomalies, exceptions, and counterexamples; whether the vision makes sense and can be affirmed; whether the words ‘must’ and ‘have to’ are covering up important questions of a broader nature; whether–and this in the most general sense–many of these statements are actually unformulated philosophical questions. After a good guided inquiry, one notices that fellow inquirers are confused and bewildered, recognizing that what they thought they knew is not actually the case but not knowing what really is the case. This state of confusion ‘purifies’ things and opens the inquirers up to the possibility of asking a novel question: “After the most important things have been shown not to be the most important and have thus fallen away, what now?” Now, we inquire in earnest, in search of greater clarity. I said, I am looking at a photograph. In the photo, there are green meadows and there is the silhouette of a tree draped across the summer grass. 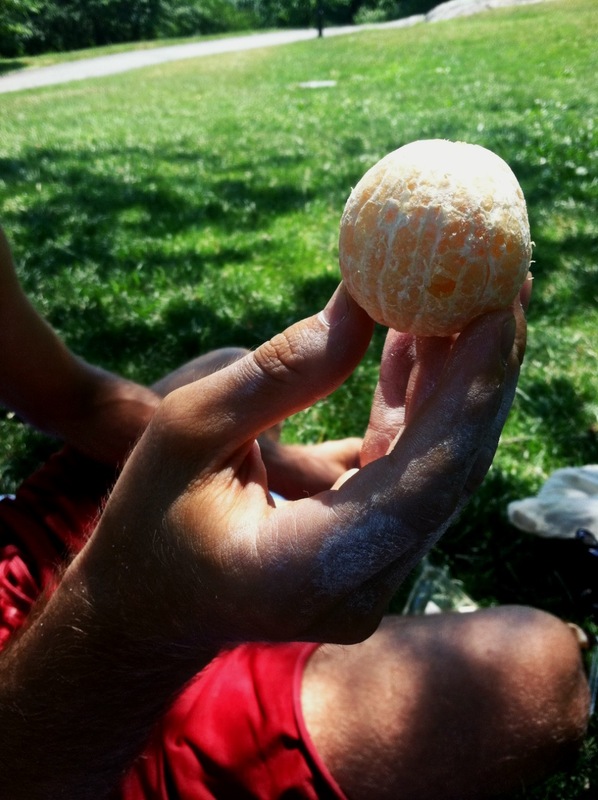 In my fingers which are stained with chalk, I am holding a clementine. I hold it up roundly, delicately, offering it to you. We are not looking at the same full moon together, I said. We are looking at the same world, orange and whole. I did not say aloud until later that evening: a world as beautiful as the beautiful world can be. Living by making postulates has helped me, even in the darker moments, not to fall into despair. Individuals in failing marriages despair that their lives could go otherwise. Institutions in free fall have lost the capacity to wonder whether they could be organized in some other, more robust fashion. Despair marks a defect in logic and imagination. In The Critique of Pure Reason, Kant offers that the scientist who wishes to investigate nature must postulate that it is organized in a such and such a way despite the fact that he does not know (yet) whether it is organized in such and such a way. The logical point seems to be that in order to inquire seriously we must first posit some hitherto unknown possibility that is as good as, if not better than the reality we are living through. Do we have reason to think that there is some better embodiable possibility? Certainly not if we draw our reasons only from the fund of past experience, history, and the current evidence of the senses. Certainly yes if we dare to imagine that there must be something, if only we look in the right way. Accordingly, a postulate is inquiry-guiding yet, importantly and as the inquiry gets underway, it does not run contrary to the mounting evidence. A postulate thus dares us to think seriously even while it cautions us to keep our eyes on the evidence of the senses. It provides us with two kinds of ‘looks’: the well beyond and the right here. It is fashionable today in social entrepreneurship circles to speak about resilience. What, it is asked, is involved in a system’s being resilient in the face of change and uncertainty? Or–to change the scale–what explains why one person can sail through the end of a marriage while another is brought low and is inconsolable unto death? Is it constitution or general temperament? Possibly. Luck (tuche)? Quite possibly. But it could also be that one has cultivated his imagination and a lived logic and, by means of both, has become adept at formulating postulates. Even though he does not know that a new life is possible, he sets his course according to the ‘must’–and then feels his way through to the end, wherever the path should take him.